Last month, President Trump announced that he would be ending the Deferred Action for Childhood Arrivals (DACA) program that was put in place under President Obama in 2012. I’m not surprised, as it’s consistent with his many other attacks on immigrant rights—even before taking office—but I’m still frightened and appalled by it. The program granted protections for young people who were brought to the US before 2007, when they were under the age of 16. 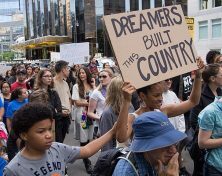 DACA eligibility requires applicants be under the age of 31, graduated from high school in the US or have a GED, or were an honorably discharged veteran of the Coast Guard or Armed Forces of the US, and have no criminal record. Although President Trump has now called on Congress to provide a path forward, given how deeply divided Congress remains, efforts to protect these young people seem unlikely. This reversal in immigrant rights has already started having profound impacts on DACA recipients and their families—forcing many to go back to living in the shadows. The deep fear of being deported to unsafe places has stopped people from going to work, to school, and to the doctor, reporting crime and abuse, and even driving. The impact of this decision is a major public health concern. Approximately 800,000 people have received relief and protection through DACA, and 17,000 of these young people live in Colorado. As a result, this has driven significant improvements in health among immigrants. For example, children whose mothers were eligible for DACA were less than half as likely to have an anxiety disorder provoked by external stress than those whose mothers were not eligible. Among Hispanic adults, people who became eligible for DACA had significantly reduced incidence of psychological distress. In the Asian Pacific Islander community, young adults enrolled in DACA reported an improved sense of well-being, including reduced stress and fear of deportation, and less reluctance to seek health care. Ninety-one percent of all DACA-enrolled individuals are gainfully employed, and many are also pursuing higher education opportunities. With DACA, these young people have gained work permits and jobs, secured employer-provided health insurance, enrolled in college, and improved their overall safety and well-being. All of this is now at risk. Currently, over 40% of accredited medical schools accept students with DACA, and if Congress doesn’t act, we could see more workforce shortages, especially among medical professionals that bring critical language skills and cultural competency to hospitals and clinics, nursing homes, and in-home care organizations all across the country. While efforts have been made by GOP Senators to implement a path for citizenship, this new iteration of the DREAM act would take a total of 15 years for qualifying applicants to apply for citizenship with what they’re calling “extreme vetting” and would not allow for young people to sponsor their parents. This legislation remains damaging to many families and unacceptable to many who are and work alongside immigrants. The damage that is caused among families being targeted and torn apart can be irreversible. As a nation, we should be supporting our friends who have grown up with us, go to school with us, and are people we love and care about. We must stand up to those that seek to do us harm. As a community organizer at my core, I know that there is power in numbers. The fight for immigrant rights may be long, but I'm ready for it. Will you join me? Take action and ask Congress to pass a clean DREAM Act. Please contact us or any of the immigrant rights groups below for ways to take action or get resources. First, find your representative. Then, call the House of Representatives switchboard to be connected to them: (202) 225-3121. “Hi my name is _____, I am a Colorado resident and I am calling to urge your support for the DREAM Act.